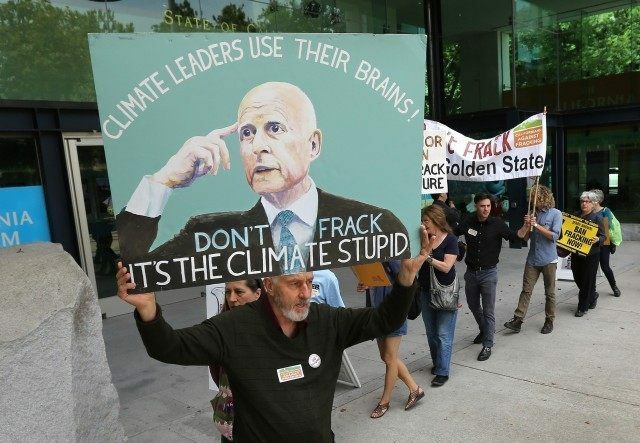 With a whistle-blower leveraging the scandal regarding use of state staff to apparently evaluate geological data for the profitability of “fracking” on his private land, California Governor “Big Oil Brown” is headed for the limelight at the Paris climate change summit. As Governor Brown joins President Obama and the official U.S. delegation flying to Paris, enthusiasm for world government controlling world economic activity has dwindled on the cusp of opening ceremonies for the United Nations Conference of Parties (COP 21). Despite a survey by GlobeScan indicating that worldwide interest in an ambitious and binding agreement to address “global warming” has fallen to the lowest level since Brown took office in 2009, the Governor “Moonbeam” hopes to be in the limelight as global climate change’s biggest advocate. But in spite of massive funding from the Obama Administration, California and other Democrat controlled states to “prove” man-made “global warming” is a crisis, the most recent Intergovernmental Panel on Climate Change Assessment, based on actual RSS satellite records, had to acknowledge that in the 19 years since 1998, global temperatures rose by less than an insignificant 0.1 degree Fahrenheit. The British, whose Prime Minister Tony Blair recruited Al Gore to the cause, just announced they are going all-in-for-fracking. As a result, they intend to issue pink slips to up to 40 percent of their 250 high-paid bureaucrats that have traveled the developing world to drum-up support for the UN’s plan for radical reductions of CO2 emissions in exchange for wealth transfers to the developing world. In May, the Governor Brown signed an agreement between California; Vermont; Oregon; Washington; Wales, United Kingdom; Acre, Brazil; Baden-Württemberg, Germany; Baja California, Mexico; Catalonia, Spain; Jalisco, Mexico; and Ontario, Canada to make 80 percent cuts in emissions of greenhouse gases by 2050. But all this environmentalist sparkle has been somewhat undermined by Breitbart News reporting of Jerry Brown’s wealth and energy interests. In ‘Brown Blasts Republicans on Climate–but Silent on His Oil Fortune,’ Breitbart outlined how former Gov. Pat Brown, Jerry’s father, set up two political trading company that had the exclusive right to get fees on every barrel of oil production by Royal Dutch Shell’s Indonesian subsidiary after a 1960s coup by local generals. Jerry Brown inherited a major interest in the family oil business after he left office in the 1970s. In April Breitbart News reported in ‘Brown Not Cutting Oil Industry Water Use’ that Governor Brown signed an executive order implementing California’s first-ever mandatory water restrictions that require cities and towns to cut their water usage by 25 percent over the next nine months. But Brown exempted cutting oil company water use for fracking because the industry pays over $20 billion in state and local taxes. Despite Brown’s tirades against fossil fuels, he has been very supportive of the California oil industry while governor. He pushed through and signed pro-fracking legislation in late 2013, known as Senate Bill 4. He also quietly accepted $1.72 million in political donations in recent years from oil and natural gas interests for his statewide political campaigns for attorney general, governor, and Proposition 30 tax increase. In response to Governor Brown’s unflinching support for hydraulic fracking, Oil Change International, a research and advocacy organization that focuses on “exposing the true costs of fossil fuels and facilitating the coming transition towards clean energy,” created the web page “Big Oil Brown” featuring the Governor attired like a Texas oil baron in a country-western suit and cowboy hat standing next to an oil rig. But despite the two faces of Jerry Brown as the global warming leader trying to save the planet and Big Oil Brown “doin some oil bidness”, the California Governor is expected to be a top performer at the Paris UN COP 21.